This morning we awoke to gray, threatening skies. Our plan was to walk through the historic Uptown section of St John and were determined that the weather was not going to change that plan. On the way into town from the campground, we stopped at the Visitor Information Center and got some literature on the various historic district walks and decided to focus Prince William Street, a few blocks from the waterfront. St John is New Brunswick's largest city and biggest port (although the harbor looked a bit empty). The harbor was discovered by Champlain in 1604, but was not settled by the French. 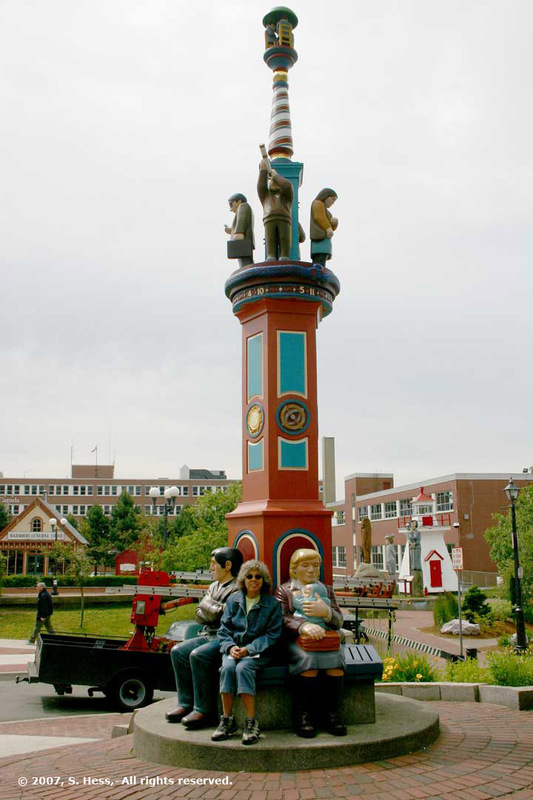 In 1783, 14,000 British loyalists, displaced by the War of Independence, moved here and created this town and several others in the immediate area. Due to its harbor, the city became an economic success and was one of the largest wooden shipbuilding centers in the world. The decline in the use of wooden sailing ships caused an economic downturn in the 1860s. The downturn was made worse by a great fire in 1877 that destroyed much of the Uptown area. 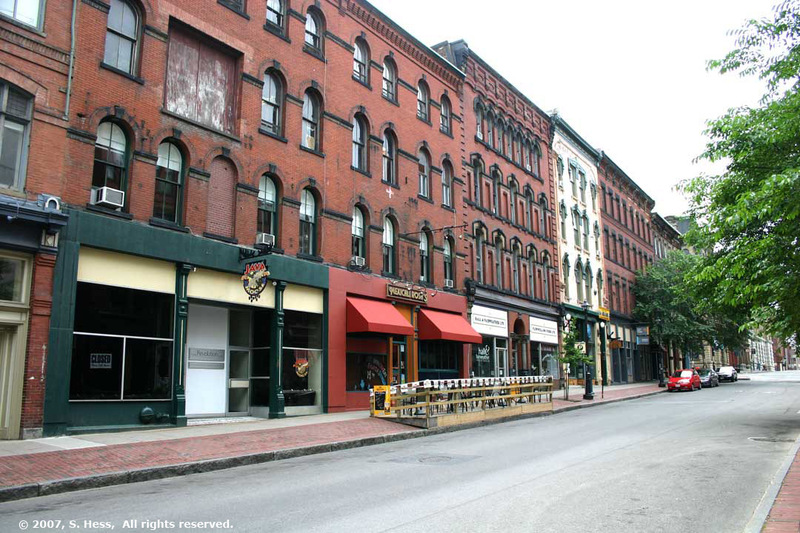 When it was rebuilt, it was replaced by safer brick and stone buildings, many with ornate victorian touches. The Prince William Walk took us through this rebuilt area. As we walked down Prince William Street, I was surrised by how few people there were around. I assumed that on Sunday we would not see many businesses open except those catering to the tourists. I also assumed that we would see many more tourists. Perhaps it was the weather or the fact that it was a Sunday but we had the district pretty much to ourselves. Some of the typical buildings found along Prince William Street. 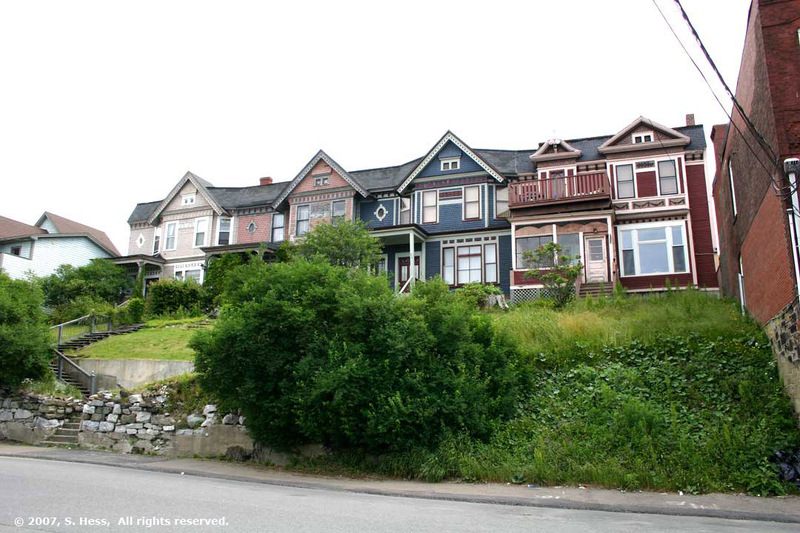 They were built after the fire of 1877. The towhnomes on the left are at the southern end of the street and were the only dwellings we saw. 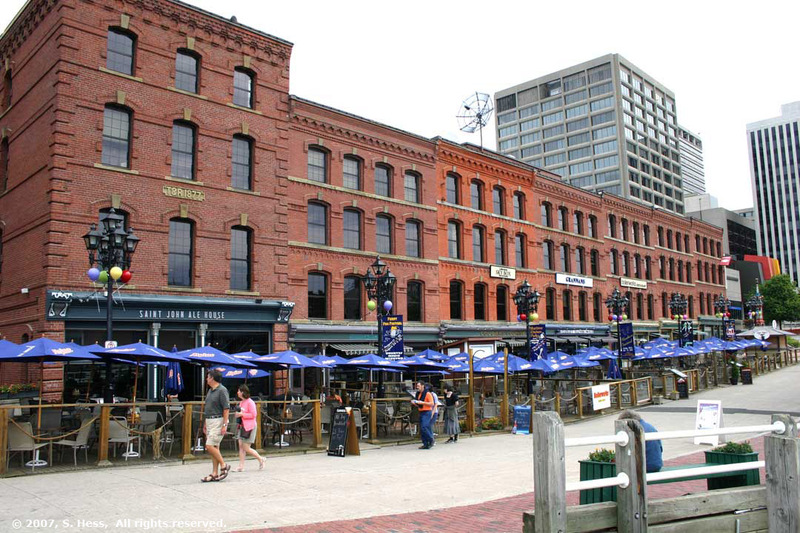 We did notice that some of the commercial buildings were being converted to condos. 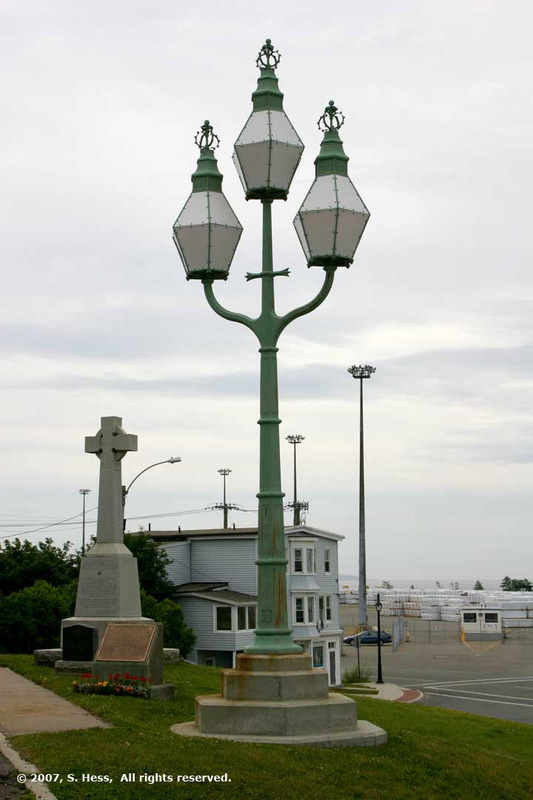 The trident light, known as the Three Sisters, was placed at the foot of Prince Willian Street in 1848 as a navigation beacon for mariners. Susie and friends. 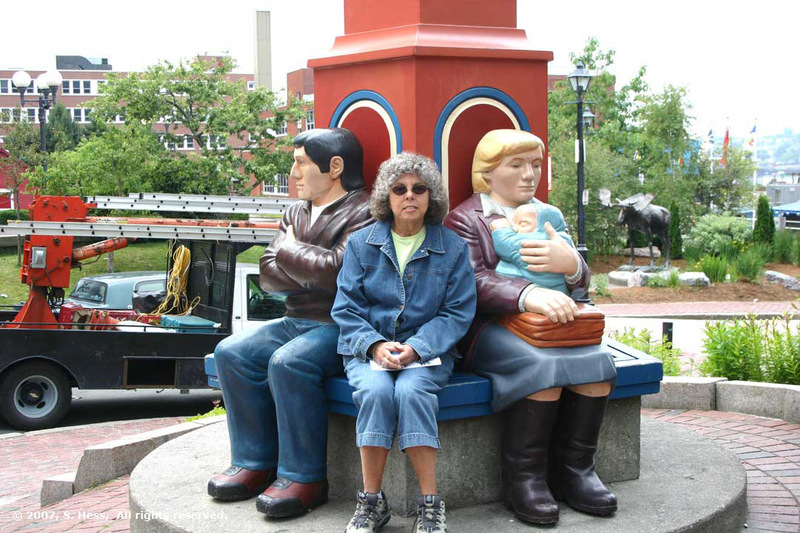 This sculpture, which appears to be a clock, was in front of the Market Street Complex. See picture at left for more detail. The fire of 1877 destroyed all the buildings around Market Square. After the fire warehouses were built along both sides of Market Slip (which stood approximately where I took this picture). 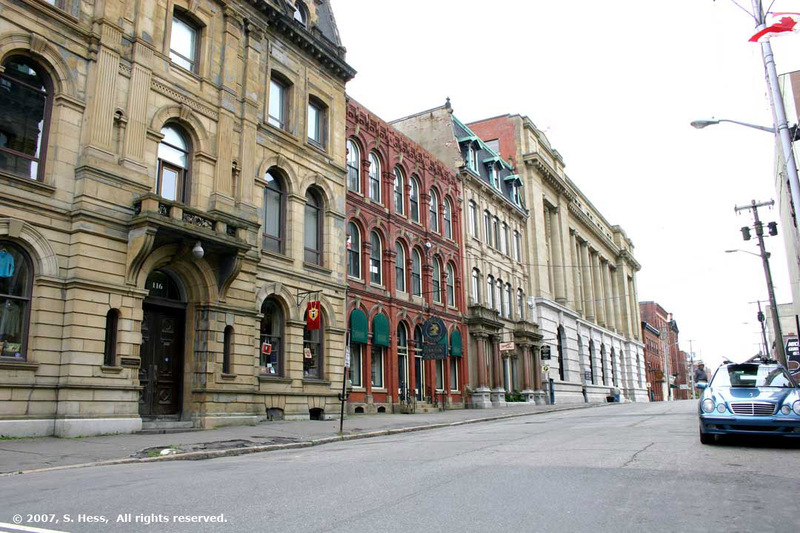 These seven buildings were incorporated into the Market Square complex which includes shops and New Brunswick Museum. The lower levels of these buildings are occupied by restaurants which were fairly empty considering it was lunch time.